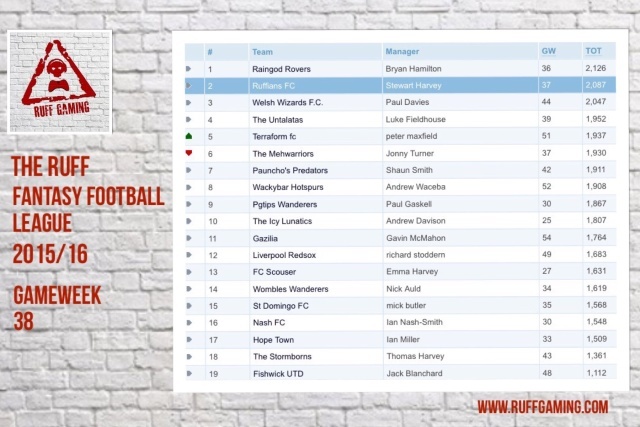 The Ruff Fantasy Football League 2015/16 - Season End! Ruff Gaming » Ruff's Fantasy Sport » The Ruff Fantasy Football League 2015/16 - Season End! 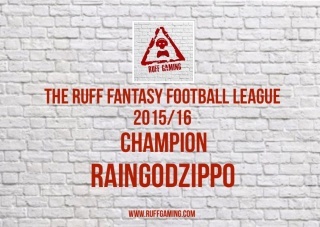 The dust has now settled and the final points have been counted for the Ruff Fantasy Football League 2015/16 season and RaingodZippo has been crowned a very worthy winner making it 2 years in a row he has won the title! A massive well done to Mr Zippo for his skilled management of his team keeping him 2 or 3 steps ahead of everyone else. Can Raingod equal X Bulldogs record of 3 titles on the trot next year or will someone else be challenging for the crown! RaingodZippo wins a place in the Hallowed Ruff Gaming Hall of Fame! The Ruff Fantasy Football League will return once again for the next season in August so keep an eye out for the sign up of the new season! Below are the final standings for the 2015/16 season. A big thanks to everyone that entered and see you next season!